As I write this blog post there are 3,348 pictures on my phone – all taken in 2018. The vast majority of the pics are of my kids, my wife, my pets, and if I must be honest, the occasional selfie. 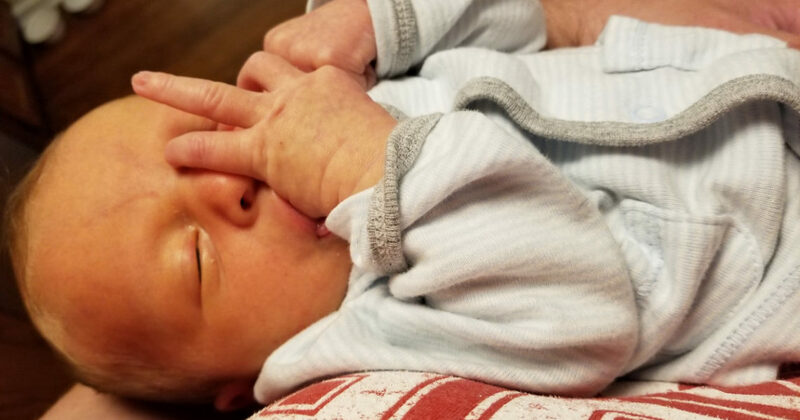 Heck, in just the ten days since our fourth child was born, I alone have taken over 200 pictures of him in various states of adorableness. Add in the pics my wife and our extended families have taken of him and the total has to be close to 500 pictures. 500 hundred pictures of one person (albeit a super cute one) in just ten days! It’s clear that with the technology in our phones and the ability to have unlimited storage in the cloud, we can snap as many pics as often as we like in an effort to capture any moment we deem picture worthy. And let’s face it, what moment isn’t picture worthy these days? I can’t help but wonder though, is that really the best way to document the lives of our children? If you would have asked me that question a month ago, I probably would have said yes. Absolutely. We have the technology, let’s use it! But something happened recently that made me change my way of thinking. Maybe pictures and videos aren’t enough. Maybe I could be doing more. We’ve all heard the idiom a picture is worth a thousand words and as a marketer, I wholeheartedly agree with that sentiment. If given the choice to show a consumer a picture that accurately describes a product or one of its features versus writing about it, I’ll chose the picture every time. However, our kids, our families: they aren’t lifeless products. They are part of us. We take pictures of them to capture those moments that have meaning. But what if we, as the parents, aren’t around to add the context to the pictures as the grown up versions of our children are looking back on them? Will those pictures still carry a thousands words worth of context on their own? I came to this realization very recently, and it’s totally changed how I think about the legacy we’ll leave behind for our kids. My father passed away 15 years ago and it’s still difficult for me to fathom that he wasn’t around to see me get married and start my family. For any one who has lost a parent, you know how difficult it is to handle. For me, it hit me really hard. My dad was my best friend, and I just wasn’t ready to live my life without him. And for a long time, I did my best to hide the pain and not deal with my grief in a positive way. As a part of that denial, I’ve had several boxes of my dad’s personal belongings that I just never could bring myself to sort through. Every time that I thought enough time had passed where I could finally be strong enough to look through the contents of the boxes, as soon as I opened one up, the pain would immediately come back. So I would put the lid back on the box and stash it away in the basement where I wouldn’t have to see it or deal with it. Sometimes however, life has a way of pushing you forward whether you feel you’re ready to move on or not. As my wife was pregnant with our fourth child, we decided that we needed to move to a new home that would be more conducive to raising our growing family. Now you might be thinking that more kids = bigger house. But that math just didn’t add up for us. Nope, we decided it was time to downsize! We knew that we had acquired way too much “stuff” over the past decade and we felt like material things were taking away from the experiences we wanted to be able to provide our kids. So we decided to donate, sell, or flat out get rid of the things we had that didn’t add value to our lives or the lives of our kids. I mean did we really need that internet connected juicer? However, as we started downsizing in an effort to move in to a smaller house, I knew in the back of my mind that I was finally going to have to face those boxes that contained my dad’s keepsakes. I told myself I still wasn’t ready. But I also knew that logically it made no sense to simply move the boxes to the new house so I could continue ignoring them. That would totally defeat the purpose of downsizing. So on a Saturday morning, I told my wife Nicole that I needed to be alone in the basement for a while. She knew what I was intending to do, and she gave me words of encouragement to move forward. I gathered the boxes, sat down in a chair, and hesitantly opened up the first one. Right on top was a folder that contained many of the things that my dad had written down over the years. 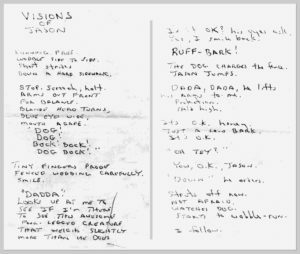 As I started to flip through the various papers that contained some of my dad’s imaginative writings, my heart skipped a beat when I saw a faded, handwritten page titled “Visions of Jason”. IS IT OK? HIS EYES ASK. THE DOG CHARGES THE FENCE. By the time I got to the end of this short story, I could barely see the words on the page due to the tears that had welled up in my eyes. These words were describing an encounter that happened when I was probably just three years old, over forty years ago. And if you count those words, you’ll find that there are only 125 of them on that page. These 125 words had more of an impact on me than any amount of undiscovered pictures could. In just a few short sentences, my dad managed to capture the essence of what a father-child relationship is and should be. Inviting exploration. Passing on knowledge. Offering protection. All while giving words of encouragement and reassuring smiles. You just can’t capture that kind of feeling and meaning in a picture without the person who took it there to tell you what they were feeling, thinking, and doing at the time. So in this case I’ll take the words over a picture any time. The impact this discovery had on me is undeniable. While I’ll still continue to take a ridiculous amount of pictures of my ridiculously cute children, I’m going to make a real effort to detail thoughts, feelings, and experiences in writing. And not in a Google Doc or the Notes app on my phone. But with a pen on paper. I know someday I won’t be around any longer, and I want each of my kids to know how I felt during various times of their lives. I want them to feel my presence just as I feel my dad’s when I read those 125 words that he wrote oh so many years ago. I would encourage my fellow fathers and fathers-to-be to do the same. I know we’re all busy, but trust me, the words you leave behind will have more meaning to your children than you’ll ever know.